Fort Pierre Chouteau, South Dakota by Frederick Behman, 1855. For nearly 25 years, Fort Pierre Chouteau, South Dakota stood as a symbol of the relations between Euro-Americans and American Indians and their interdependence. 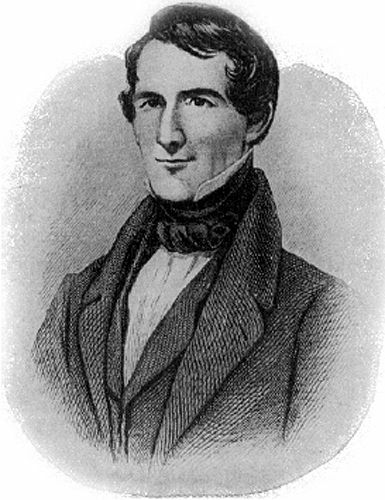 In the 1820’s, John Jacob Astor, head of the American Fur Company, decided to expand his operations into the Upper Missouri River region. In 1832, Pierre Chouteau, Jr. established Fort Pierre Chouteau to replace nearby Fort Tecumseh. 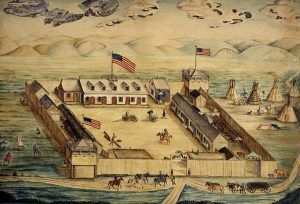 Within no time, Fort Pierre Chouteau became the most strategic post in the Western Department of the American Fur Company. Located halfway between the headquarters at St. Louis and the northernmost posts in North Dakota and Montana, Fort Pierre Chouteau was the logical place for American Fur Company officials to gather and discuss company business. Its trade area covered thousands of miles of Great Plains. Continually growing in size and influence, the fort evolved into a trading center where the exchange of material goods between the Euro-American traders and American Indian cultures occurred in ways that significantly affected both societies. 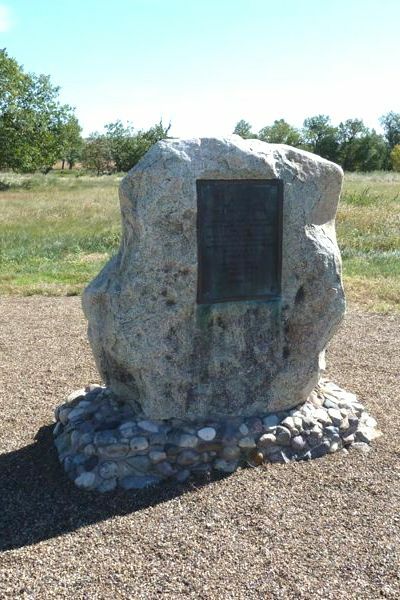 Not only was the fort one of the largest and best-equipped trading posts in the northern Great Plains; but, the trading activities at the site epitomized the commercial alliance between Native Americans and Euro-Americans. Its location on the Missouri River assured the success of the fort’s fur business. During its active years, the post received, processed, and shipped hundreds of thousands of beaver pelts, deer skins, and buffalo hides destined for European and eastern markets. Through Fort Pierre Chouteau and its subsidiary trading posts, the Plains Indians found their primary contact with incoming white settlers. A new-found prosperity followed that led the American Indians to accept, for a time, the white man’s encroachment on the Plains. The fort underwent numerous additions and changes. Travelers up the Missouri River during the first half of the 19th century described the fort. The most reliable of those descriptions was that of Prince Maximillian’s, made in 1833. He estimated each side of the fort to be about 300 feet long. The prince also described the post manager, William Laidlaw’s house with adjacent houses for clerks. According to him, stores stocked with furs and trade goods were located opposite the living quarters. George Catlin visited Fort Pierre the previous year and naturalist John J. Audubon a decade later. Their journals and the memoirs of members of their parties provide a picture of the fort’s construction. Because the fort was active for over 25 years, the numerous physical changes that took place caused quite a variation in the content of these accounts. The American military entered the northern Great Plains in the 1850’s and the United States Army bought Fort Pierre Chouteau in 1855 making it the first military fort in the Upper Missouri River region. After purchasing the fort, the army conducted nearly $20,000 worth of repairs to meet army standards. The army also added numerous portable clapboard houses they transferred to Fort Pierre by steamship. The old fur post proved to be in such a poor state of repair, however, that the army partially dismantled and completely abandoned it in 1857. The outline of the old stockade was still visible at the turn of the 20th century, but there are no visible remains today. Excavations of the fort took place in 1980 and again from 1997 to 2001. A geophysical survey was also conducted in 2007. The archeological excavation uncovered various artifacts such as coins, pottery, fabric, and wooden remnants of the fort itself. Clothing, including moccasins, was also found, indicating the close relationship between Euro-American settlers and Native Americans. Perhaps the most significant fur trade/military fort on the western American frontier, Fort Pierre Chouteau was the largest (almost 300′ square) and best-equipped trading post in the northern Great Plains. Built in 1832 by John Jacob Astor’s (1763-1848) American Fur Company as part of its expansion into the Upper Missouri region, the trading activities at the site exemplified the commercial alliance critical to the success of the fur business. The site is now marked by a stone monument, located about one mile north of Fort Pierre off of SD Hwy 1806 on Fort Chouteau Rd. There is parking on the right side of the road. Follow the gravel path to the monument. Compiled by Kathy Weiser/Legends of America, updated July 2018.